GMAC announced the name change to Ally today in a press release and on its Web site, shown. Ally Financial Inc.'s decision to apply the "Ally" name to most of its consumer and dealer-related auto-finance operations in North America will mark the demise of the GMAC brand after nine decades of auto lending on the continent. When GMAC announced in May it would adopt the Ally name at the corporate level, it considered continuing the use of the GMAC label for the products it supplies to General Motors Co. dealers. That prospect ended with Tuesday's announcement of the name change, which came several weeks after GM failed in a bid to buy control of its former captive lender. "The move to the Ally name allows us to invest in a brand that we own and can build upon for the long term," said Ally President Bill Muir. "An ally is someone you rely on to support you, and our new brand embodies our 90-year heritage as a trusted finance source for the automotive industry." The Ally brand will be used to support GM, Chrysler Group, Saab, Fiat Mexico and Thor Industries, a maker of recreational vehicles. 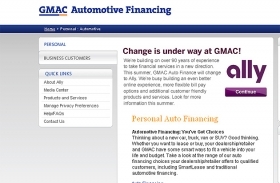 Ally's auto financing operations outside North America will continue to operate under the GMAC brand while the company evaluates using the new marquee in other regions. The name change does not apply to the Suzuki dealer network. Ally is the preferred lender for Suzuki, whose U.S. sales have plunged 49 percent this year after a 54 percent drop in 2009. GMAC, traditionally short for General Motors Acceptance Corp., has been cutting ties to the automaker ever since GM sold a majority stake of its finance unit in 2006. According to an August regulatory filing, GM's contract requires it to work exclusively with Ally for most special financing deals. But starting Jan. 1, GM will be able to offer an unlimited number of financing deals with other banks, as long as Ally has an opportunity to participate, too. Ally -- one of the world's largest automotive financial services companies -- extended more than $16 billion in credit to retail customers in the first half of 2010 in the United States, Canada and Mexico. That's up more than 120 percent from the first half of 2009. Also during the first six months this year, the company extended an average of about $2 billion of credit per month to U.S. consumers. Since its emergence from bankruptcy last year, GM has strived to broaden its financing and lending options for customers to help drive sales. The automaker considered replacing Ally with its own finance company. GM can't purchase Ally Financial because it can't legally own a bank. Ally Financial needs to keep its bank holding company status to be eligible for federal aid and to raise money through deposits. But GM's "junk" credit rating hampered its ability to raise low-cost capital to finance and operate another acquisition. The U.S. government owns 61 percent of GM and 56 percent of Ally Financial, formerly GMAC. Instead of creating its own finance arm, GM is looking to broaden its lending ability by talking with other banks -- including JPMorgan Chase & Co., Bank of America Corp. and Wells Fargo & Co. The banks would write loans and leases on cars, said four people with knowledge of the situation who asked to remain unidentified because the discussions are private. GM also has an agreement with AmeriCredit Corp. to supply auto loans to subprime customers, or those with risky credit. GM's chief competitors, including Ford Motor Co., control their own finance arms. Such captive lenders help the holding company's sales by assuming additional risk and paying to reduce interest rates on subprime borrowers' loans and move them into near-prime loans. Last month, GM CFO Chris Liddell said the company would consider a variety of sources for consumer car loans rather than carry the assets and liabilities of a lending business on its books. "As we enter an exciting new chapter in GM's history, Ally remains an important partner and auto financing provider for GM customers," Liddell said. "We look forward to continuing that relationship."